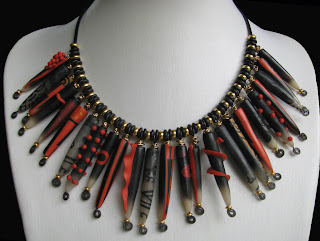 Much as I love the bunched up "urchin" look of the beads posted on the buna cord last week, I'm not sure if I'm ready to present something that avant garde to the buyer. It's trendy, but would have a more limited customer base. This is still different and trendy, but is more traditional and thus more commercial. I think this will be an interesting design to play with, especially in line with the Modular Art Jewelry we worked with last month. The main difference here is that I've placed spacer beads between the Urchin beads so they don't bunch up. This could be designed so the individual beads could be slipped off, the spacer beads removed, and the more dimensional and "bunched up" look could be an alternative. Merci Louise, vous etes bien aimable! What a stunning piece. I like it equally as much as the other one. I think they are just to be worn at different occasions. Thank you. Your comment is really appreciated. I agree with you - one more on the edge, the other a little safer, maybe even more casual.